Nothing, it seemed, could go wrong for Abraham E. Lefcourt prior to 1930. Born on New York’s Lower East Side, he started business manufacturing ladies’ apparel. In 1910 he built his first building, a 12-story structure at 48-54 West 25th Street that housed his factory on two floors. By 1929 Lefcourt not only commanded a vast real estate empire, but was president of the Lefcourt National Bank & Trust Company. On October 3 of that year he announced that he would build the tallest building in the world at the northwest corner of Broadway and 49th Street – the Lefcourt Building. Exceeding the Chrysler Building by four feet in height, it was to cost an estimated $30 million. Negotiations began for leasing the land from brothers Samuel, Max and Maurice Brill, where their Brill Brothers clothing store stood, and the architect Victor A. Bark, Jr. was commissioned for the project. Nothing, it seemed, could go wrong for Abraham E. Lefcourt. Suddenly, however, Lefcourt’s fortunes plummeted. Three weeks after his announcement, the stock market crashed. The plans for the skyscraper were quickly reworked, reducing the structure to a $1 million, 11-story office building. 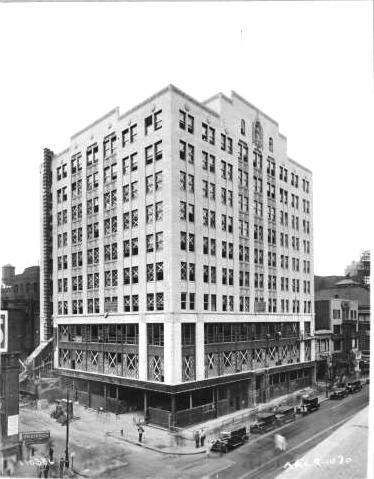 The developer continued to lose millions even as the Lefcourt-Alan Building was completed in 1931. By the fall of that year Lefcourt defaulted on the agreement with the Brill Brothers, who foreclosed. The building which he intended as a monument to his son was renamed the Brill Building. In November 1932, with a judgment pending against him and his world collapsing, Lefcourt suddenly died. While the official report blamed a heart attack, rumors of suicide persisted. His one-time $100 million fortune was reduced to a few thousand. Perhaps more significant than the Brill Building’s striking Art Deco architecture, with its contrasting brass and polished black granite, and terra cotta reliefs, it is subsequent place in American music history. Early tenants were music publishers, many having roots in Tin Pan Alley. Cab Calloway, Duke Ellington, and Tommy Dorsey had offices here along with their music publishers. By the 1950’s radio disk jockey Alan Freed and Nat King Cole leased space here. Leiber and Stoller wrote for Elvis Presley here; Red Bird Records, famous for its “girl groups” was on the 9th Floor, and Burt Bacharach and Hal David met here in 1957 after which they wrote over 100 songs together. Throughout the years the building was home to publishing houses such a Lewis Music, Mills Music and Leo Feist, Inc. and composers Johnny Mercer, Billy Rose, Neil Sedaka and Rose Marie McCoy. By 1962 there were 165 music businesses here. Initially the entire second floor –approximately 15,000 square feet—housed The Paradise, a cabaret where music for the floorshows was supplied by bands like Glenn Miller and Paul Whiteman. Later it became the Hurricane with tropical palms and flowers, headlining Duke Ellington. In 1944 it was Club Zanzibar where Nat King Cole, Cab Calloway, Ella Fitzgerald, Louis Jordan and the Ink Spots entertained guests in evening attire. Abraham Lefcourt’s striking Art Deco monument to his son was designated a New York City landmark in 2010. I worked in the Brill Building in the late 60s for a Music Publishing Co. called JATA, owned by Jay and the Americans. I saw many people in the Music Entertainment business coming and going, in the year that I worked there. Great memories!